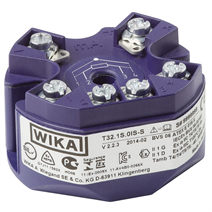 These temperature transmitters are designed for universal use in the process industry. They offer high accuracy, galvanic isolation and excellent protection against electromagnetic influences (EMI). Via HART® protocol, the T32 temperature transmitters are configurable (interoperable) with a variety of open configuration tools. In addition to the different sensor types, e.g. sensors in accordance with DIN EN 60751, JIS C1606, DIN 43760, IEC 60584 or DIN 43710, customer-specific sensor characteristics can also be defined, through the input of value pairs (user-defined linearisation). Through the configuration of a sensor with redundancy (dual sensor), on a sensor failure it will automatically change over to the working sensor. Furthermore, there is the possibility to activate sensor drift detection. With this, an error signalling occurs when the magnitude of the temperature difference between sensor 1 and sensor 2 exceeds a user-selectable value. The T32 transmitters also have additional sophisticated supervisory functionality such as monitoring of the sensor lead resistance and sensor-break detection in accordance with NAMUR NE89 as well as monitoring of the measuring range. Moreover, these transmitters have comprehensive cyclic self-monitoring functionality. The dimensions of the head-mounted transmitter match the form B DIN connection heads with extended mounting space, e.g. WIKA model BSS. The rail-mounted transmitters are suitable for use in all standard rail systems in accordance with IEC 60715. The transmitters are delivered with a basic configuration or configured according to customer specifications.